The Artisan Series is a patent pending designer inspired rail line that provides an elegant custom look for any pool environment. The Pooldeck G1 Grab Rail is a popular choice. It has been designed for the swimming pool that has vertical steps in the wall. 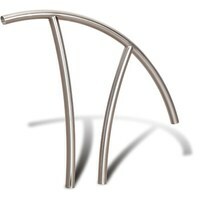 The Pooldeck G2 Grab Rail is a low profile "P" style rail. Very retro, circa 1950's. It has been designed for the swimming pool that has vertical steps in the wall. 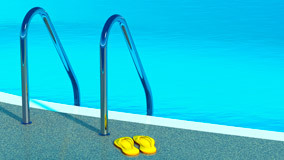 The Pooldeck G4 Grab Rails are a "D" styled rail. It has been designed for the swimming pool that has vertical steps in the wall with a narrow coping or pool deck. The Pooldeck HD Hand Rail has been designed for swimming pools with a fibreglass shell, vinyl liner or one that has steps. This is a very versatile product. The Pooldeck LS ladder is a popular general purpose domestic ladder which fits most applications. Fitted with white moulded treads. The Pooldeck LU ladder is a popular domestic ladder. It's suited to pools that have a narrow coping or a narrow pool deck. e.g. Close to a fence or narrow coping.